Across the planet, in the places where fossil fuels are sourced, people are resisting new energy developments. 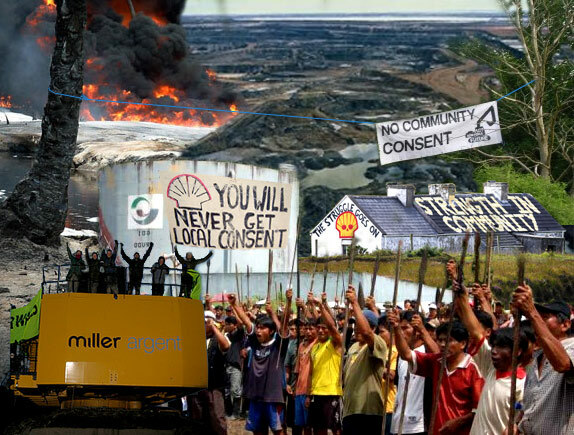 Communities are standing together to defend their homes, health, land and water, and our shared planet… This is localised resistance with huge global significance…. From the tar sands of Alberta, Canada to the woods of Mainshill, Scotland…. from the rivers and plains of the Niger Delta to the Amazon jungles of Peru…. and from the valleys of Merthyr Tydfil, Wales to the Northwest coast of Mayo, Ireland…The ride has basically started, if you want to find us, and if the technology works, you should be able to see where we are with the map on this page. his morning we opened our tent zips to the sight of the beautiful mountains surrounding Killarney. The dinner group set off early to prepare a meal for fifty people with no kitchen or stove to work with. So, instead they arrived in Trelee, after some leg-boggling uphills and awesome down hills, to ride along a nature trail and set-up the people’s kitchen in a local park. After some relaxed mega-chopping a buffet of delicious salads was served as the sun came down, and some riders did yoga to stretch out post-cycle cramps. As the dinner crew set off in the morning the rest of the group headed into Killarney for a critical mass. As the good weather continued; music was pumped through the town’s streets by Peddles the bicycle sound system and the cyclists filled the roads handing out newspapers as they moved round the town. On leaving Killarney the mass cycled round a Topaz petrol station and let people know that Topaz is a Shell re-branding. After ten minutes spirits were high and the drivers seemed amused and enjoyed the show. Tonight we’re staying in a Taekwon-Do hall with a squidgy floor to sleep on. No sleeping mats tonight. Up tomorrow for an early ride, goodnight!